The SPECAL approach to the care of people with dementia began with one family’s encounter with Alzheimer’s disease in the 1970s. Penny Garner watched over her mother, Dorothy, as she journeyed through dementia over ten years. This gave her remarkable insight into the experience of the disease. Penny’s father, Sam, a busy GP, gave her insight into the challenges posed by dementia to the medical profession. A handful of professionals with a counter-intuitive and enlightened approach also informed her understanding of dementia and its management. Penny worked in collaboration with the Oxfordshire Community Health NHS Trust at Burford from 1990 to 2000. During this period SPECAL was part of the Alzheimer’s Disease Society, as it was then known. The late Tom Kitwood of Bradford University took an active interest in SPECAL and helped Penny to establish a conceptual framework for the SPECAL method at Burford. In 1999 the Royal College of Nursing carried out a formal evaluation of the work of SPECAL, with positive findings (see Our Research). When the NHS withdrew all clinical services at Burford Community Hospital in 2000, the then Secretary of State for Health recommended that SPECAL, although not an NHS service, should have NHS support. The SPECAL team carried on working in the hospital building on a temporary basis. 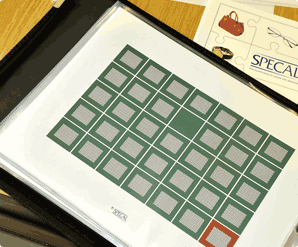 Penny explained the basis for the SPECAL approach to dementia management in a piece of writing called the SPECAL Photograph Album. In 2002 SPECAL became an independent charity, and in the following year, thanks to the extraordinary generosity of a local benefactor, the charity was able to secure the historic cottage hospital site as the base for its work. By 2005 SPECAL was disseminating its ideas more widely and running training workshops for family carers. The following year, training was extended to include professional carers. 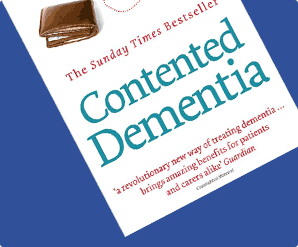 In 2008 Oliver James wrote the book ‘Contented Dementia’, generating widespread interest in the SPECAL method throughout the UK and overseas. In the first week of publication the book entered straight into number 5 of the Sunday Times best sellers list. Oliver and Penny were interviewed by the Radio 4 ‘You and Yours’ programme. To meet the increased demand for training, SPECAL introduced its Train the Trainer model. 2011 saw the production of ‘Understanding Dementia’ www.understandingdementiafilm.com/ the first of a planned series of informational and inspirational documentary-style films for training and promotion, where carers talk about their experiences and explain the benefits of the SPECAL method. IPC Media (International Publishing Corporation), one of the UK’s leading magazine publishers, named SPECAL as its Charity of the Year 2011, following a companywide vote. 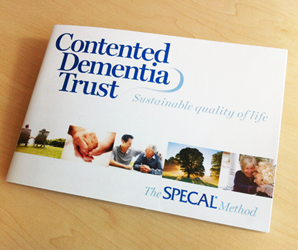 This year we have renamed our charity the Contented Dementia Trust to better reflect the aim of the charity whilst still incorporating our core asset – the SPECAL method. We hope that our fresh new image and increased internet-based information and teaching will help us to spread our positive message and share the SPECAL Photograph Album and its associated method with everyone whose life has been touched by dementia in any way.